As most of you know, over the past year or so, I’ve really been focusing on my health. Everything from sleep to movement to nutrition has become a top priority as I’ve tried to make my long-term health a top priority. As a result, I’m feeling great and have lost weight, too. 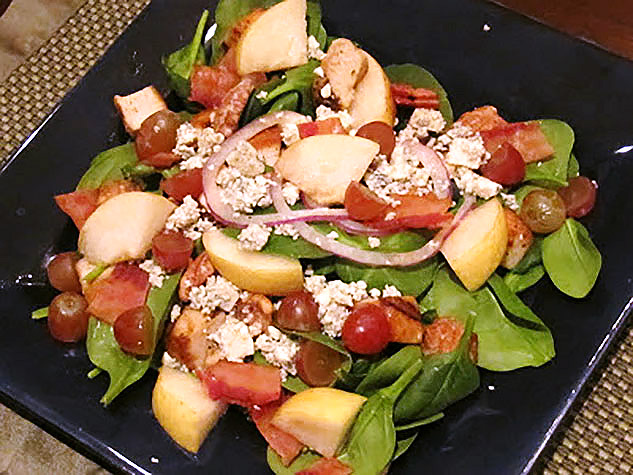 I’ve shared a little bit here and there about “how I do it,” and I wanted to share a few of my favorite eats: SALADS! Honestly, I’ve never been a person who loves salads. They were always something I’d skip on a menu. What changed? Easy—my mindset. These days, I really listen to my body. I eat when I’m hungry and I stop when I’m full (not stuffed). I eat to live, instead of living to eat, and as such I really do regard food as fuel and I want the very best in my body. And that means plenty of vegetables daily, plus some fruits, limited carbohydrates (mostly in the mornings), and the right kinds of protein. With that balance in mind, I knew I needed to be open minded to salads—they just provide a great balance of vegetables and proteins, with just the right kick of fruit and fats to be palatable, and they honestly keep me sated all day when I have one for lunch. Place first five ingredients in blender. When mixed completely, slowly add olive oil until all ingredients are blended well together. Delicious! Watch for other upcoming, easy ideas to make every day a “salad day.” To your health!